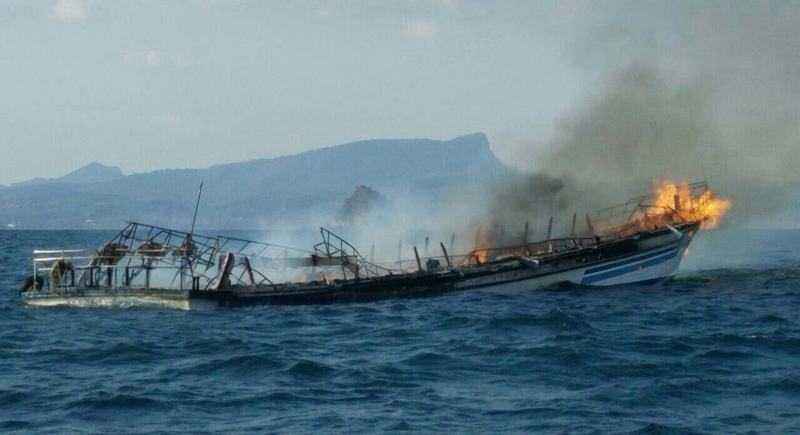 KRABI: A fire broke out on the ferry Ao Nang Princess 5 this afternoon (April 8), about two kilometres from Nopparatthara Beach in Ao Nang. The ferry burned to the waterline before sinking. Almost all the 117 passengers are reported to have been rescued by nearby boats and the Marine police. There were two exceptions – one person dead and a 12-year-old girl who is missing. Divers are now looking to see if they can find the girl. 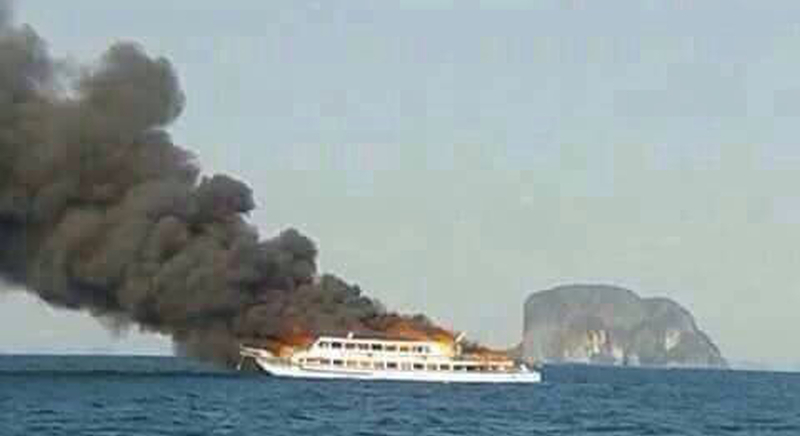 The fire broke out at 3:30 pm in the ferry, which belongs to Ao Nang Travel Tour Co. Carrying 115 passengers – 107 adults and 10 children – the ferry reportedly left Koh Phi Phi and was heading for Nopparatthara Beach near Ao Nang when the fire broke out near Koh Met. Krabi Marine Police, Krabi Marine Office, Nopparathara Park officers and 10 fishing and speed boats rushed to the scene and rescued passengers, taking them to Ao Nang, where rescue workers were waiting to ferry anyone injured to hospital. In the event, none of those who were brought ashore were injured. The skipper of the ferry, Capt Wirat Jittraporn, 51, from Krabi, said there was an explosion in the engine room, after which he told passengers to put on life jackets. Other boats were on the scene fast, he said, and passengers were able to step from the burning ferry onto the other boats. The fire burned the ferry to the waterline, after which it sank. Officials are still checking the passenger lists to identify the missing girl and the dead person. UPDATE, April 9: Authorities now say that only one person is missing, presumed dead. She has been named as Shani Maril, 12, from Israel.